Candidates and campaign staff lined up before 8 a.m. Monday in order to have a chance at being listed first on the March 2018 primary election ballot. Monday was an important date on the way to the 2018 elections. 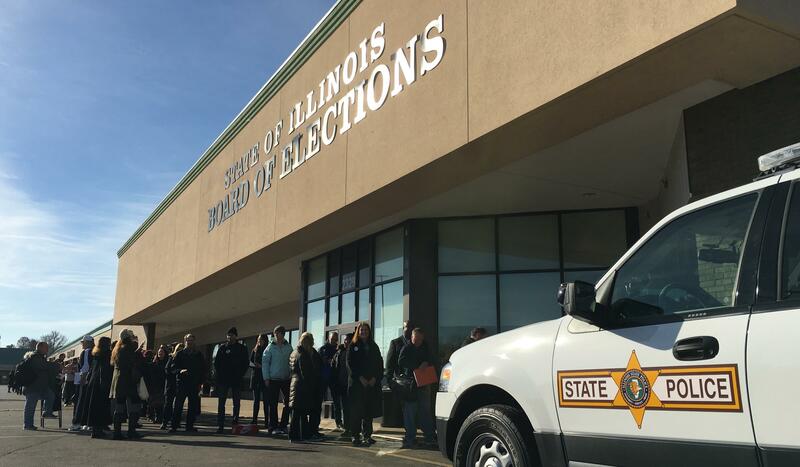 It was the beginning of the period when Illinois candidates have to file petitions with, in some cases, thousands of signatures needed to get on the ballot. The filing period lasts a week, but for hundreds of candidates, it was worth it to be in line first thing Monday morning. Brian Mackey was there at the State Board of Elections, and filed this report. Brian Mackey reports on the first day of the weeklong candidate filing period at the Illinois State Board of Elections. The first thing you need to know for this story is that a few years ago, the Illinois State Board of Elections moved into a strip mall. The second thing you need to know for this story is that a lot of candidates really want to be there right when the offices open on the first day of the filing period. I’ll come back to why. For now, know that most get there early in the morning. You can tell when people arrived by where they had to stand. MACKEY: “There's a old Radio Shack, a Tuesday Morning, Chuck-E-Cheese's — where about did you get in line?" MACKAY: "￼Just past the Tuesday Morning sign, so maybe about a hundred yards back?" Jeff Mackay is a Republican. He's running for judge in DuPage County. A little father down the line is Anne Marie Miles. Miles is running for state representative from the south side of Chicago. She’s not the first person to get philosophical about standing in line with candidates for governor and judge and Congress and the General Assembly. MILES: “We think of the political process as a big machine. And yet you don’t think about the people who are standing out, carrying their little pieces of paper that they have gone out and knocked on people’s doors, stood on street corners and said I want to make my case to the public, please sign my petition." And that may be the most important function of the filing period — it’s a moment when candidates have to put up or shut up. You can no longer just say you’re running for office; you actually have to prove you’ve done the work to get on the ballot. Republican Gov. Bruce Rauner’s campaign filed first thing, as did three of the Democrats who want his job: state Sen. Daniel Biss, businessmen Chris Kennedy, and Hyatt hotel heir J.B. Pritzker. Not yet filed are Madison County Superintendent of Schools Bob Daiber and anti-violence activist Tio Hardiman, both Democrats. Also absent was the Republican who says she’s challenging Rauner, state Rep. Jeanne Ives. They have until 5 p.m. next Monday. MENZEL: “… they have the opportunity to get first place on the ballot when they run." Ken Menzel is the top lawyer with the State Board of Elections. Some studies have a shown a gain of a few percentage points, which could easily be enough to swing a close election. But again, the research shows this applies to down-ticket races — county board or judge — not the top offices. When it comes to elected jobs in Illinois, it’s hard to get more down-ticket than a political parties' state central committeeman — or in this case, committeewoman. Rena Bever is from Mt. Carmel. It’s now about 10:30. She got in line at — well, let’s say it was closer to the Burlington Coat Factory. BEVER: “Yes, it was down that far. We were here before 8; we’re just now getting in the building." Next to Bever is Tonya Loker, from Wayne City. You wouldn’t know this from they way they’re getting on, but it turns out that Loker and Bever are running against each other — for the same seat. MACKEY: "You just met each other?" Together, Loker and Bever represent one of the less-discussed benefits of this ritual of Illinois Democracy: a new friendship, forged in a shared experience. Not bad for a Monday morning, at a strip mall, outside a Chuck-E-Cheese.